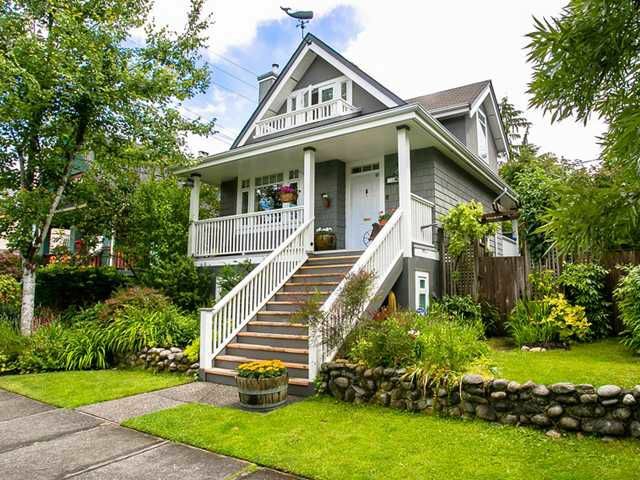 This detached COACH HOUSE is a perfect blend of modern living with classic craftsman design. The main floor of this well maintained home is bright and boasts a great layout, crown moldings and other fine detailing. The living room featuresa gas F/P and engineered oak floors which carry through into the dining room. You'll find a well-designed kitchen which opens out onto a balcony. The master and 2nd bedroom upstairs are spacious w/ vaulted ceilings and beautiful birch floors. The ensuite bathroom - tastefully renovated! On the lower level, another renovated bathroom, bedroom and inside access to parking. The lush, perennial garden is your own private oasis. This is a great neighbourhood and wonderful home!